I have a issue with insects... I really do. I feel that they are always out to get me lol You should have seen me jump outta my chair when a earwig canon balled from the roof into my tortilla soup LOL! It was pretty crazy and I could have easily broken my neck the way I jumped outta my chair but at least we all got a good laugh out of it ;p Not to mention the earwig that a couple days later decided to canon ball into the toilet just before I was about to sit down. 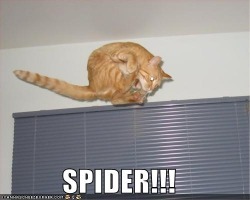 There was even a spider that cornered me in the shower the other day... *sigh* It never ends. The reason I even bring this up is because I love growing plants. In my perfect world plants would not attract bugs lol, actually in my perfect world bugs would not even need to exist lol but thats not the case. So every single day I go out to take care of my plants I have to face my fear of insects. Trust me there are way to many for my liking. Outside it is mostly tiny spiders that web everywhere + some flies and the occasional beetles at night. Not only do I have to deal with insects while watering and misting my plants but also while I am maintaining them... lets face it.. gardening requires digging in dirt, transplanting, and in some cases even root pruning... and well for some crazy reason insects like to live in the dirt!! I had to root prune some of my bonsai material because they were incredibly rootbound... while digging around in the dirt I came across a bunch of worms!! EWW!!!!! Yep I had to get my dad to pick them out for me lol I couldn't fathom the idea of it. So Yes... I fear insects... but oddly I can't kill them LOL!! I'm telling you I have serious insect issues!! I feel guilty killing even the smallest ant or fly. If I must kill one I will but I will put up quite a fuss while doing it and will have a horrible guilt afterwards. It'll be dead quiet at my house when suddenly a loud squeal followed by a "swat!" indicates that I have just killed a bug or failed to kill a bug and ran into something while running away in fear lol. I realize that bugs are an important part of life but I sure would do a whole lot better gardening if they weren't in the dirt.